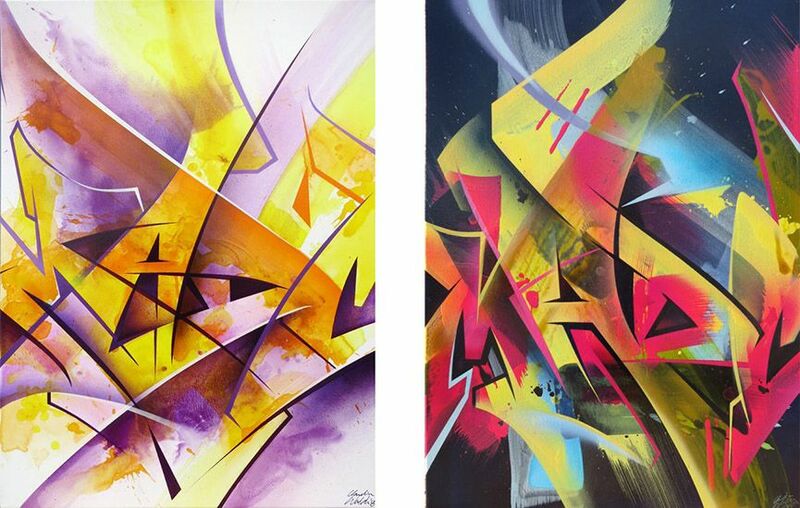 The 44309 Street Art Gallery in Dortmund, Germany have announced a new solo show by MadC entitled Night and Day that will open in January 2015. The German artist, known for her large scale outdoor artworks, will be presenting a series of new paintings on canvas along with installations. Night and Day are units of time and representations of light and darkness. Without light, there are no colours. But in the dark, illuminated colours have an even deeper impact on us. Light is an essential part of transparency. When transparent colours overlap they appear very different depending on the intensity of light they are viewed in. 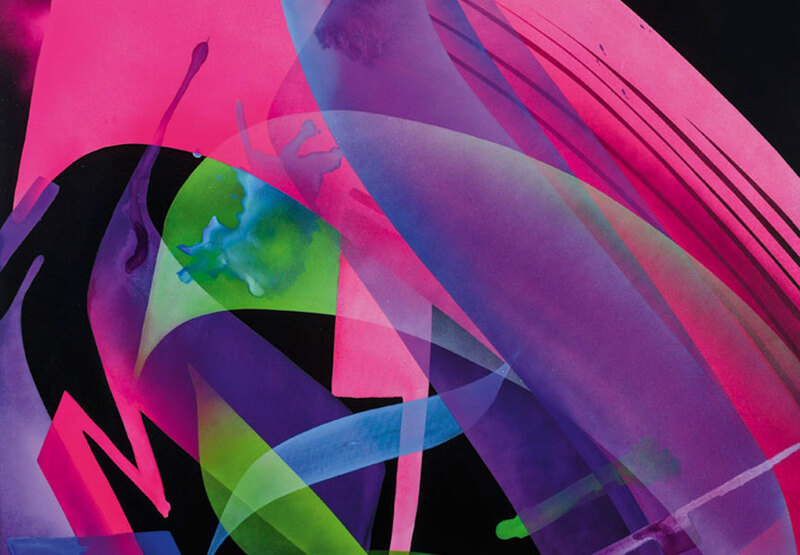 In her solo show Night and Day MadC further investigates the relationship between overlapping colours, light, glass and calligraphic movement. Night and Day is also represented in her choice of working only on a black or on a white base. 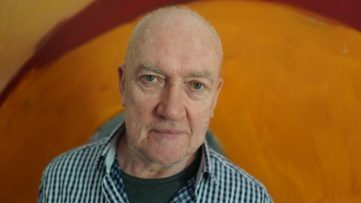 And all of MadC‘s canvases represent her life style of working 24/7 and are therefore named after the time they were finished – sometimes during the day and sometimes at night. 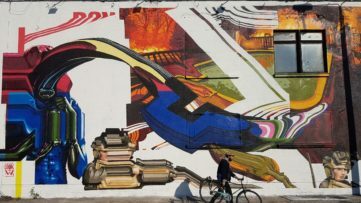 MadC, made her international breakthrough in 2010 with a piece of outdoor artwork known as the 700 Wall which was a piece of work on a 700 square metre wall along a train line between Berlin and Halle. Now the artist will be showing a selection of her new paintings in the Night and Day exhibition at the 44309 Street Art Gallery. 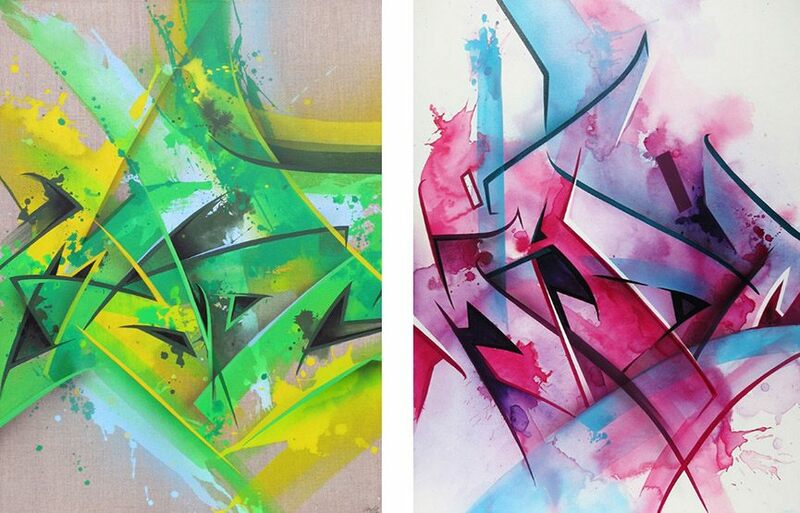 Previous studio paintings have revealed rather beautiful fluent and gestural pieces often created with watercolour, acrylic and spray paints on canvas that carry the trademark features of her larger outdoor works, incorporating vivid colour and a love of typography along with an obvious knowledge of the skill and history of graffiti writing. 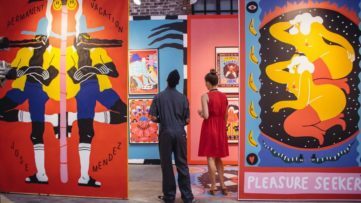 Having studied graphic design in Germany and the UK, MadC holds a master degree in graphic design which clearly shows through in both her studio pieces and street art. 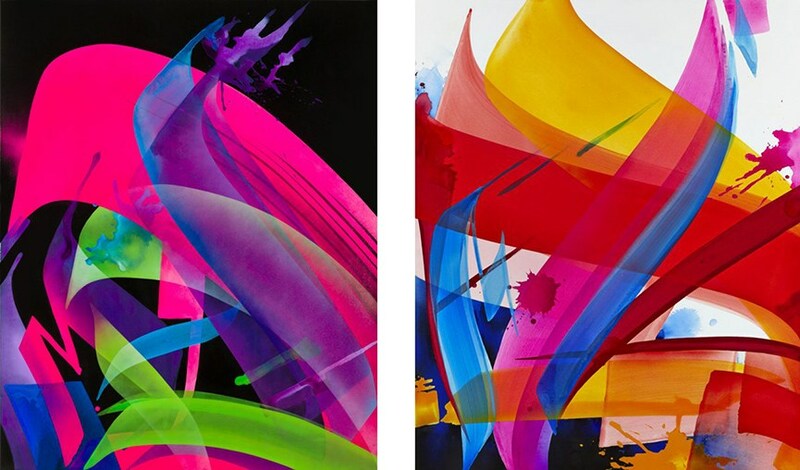 Earlier paintings on canvas such as 12-01 (2012) and 19-10 (2012), demonstrate the ability of Mad C to combine painterly elements with her detailed approach to craftsmanship as can be witnessed by the wonderful fluid abstract backgrounds and expressive gestural marks and splatters full of energy and life that provide a frenetic surface for the more careful and considered graffiti style writings that take prominence in the foreground. 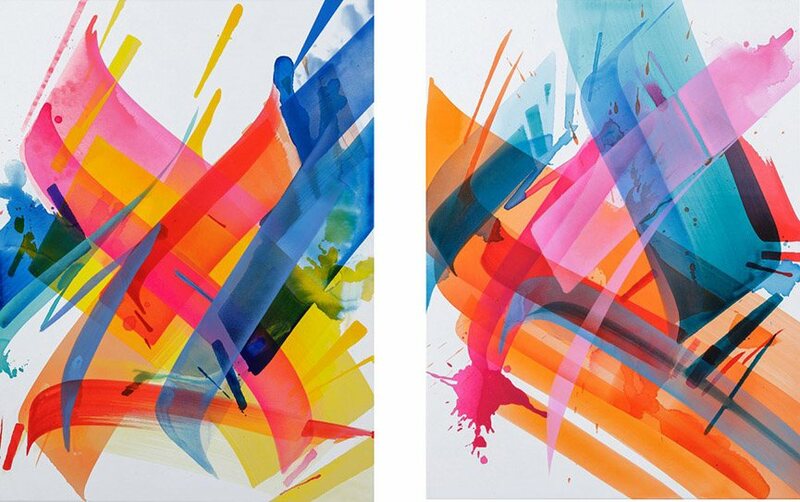 More recent works such as 17-19 (2014) and 13-41 (2013) have seen a development in the paintings of MadC, the graffiti style writing has vanished though the gestures that remain are still very much identifiable as coming from the same hand but the images have become more about colour and mark making, large sweeps of translucent colours overlapping each other almost appearing as if they are just a small segment of something much bigger. 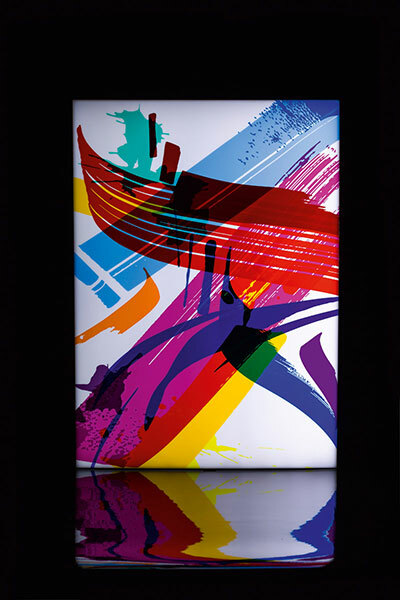 By moving in this direction, MadC is using traditional street art subject matters and techniques but re-contextualising them into a new visual language for her paintings. Born in 1980, in Bautzen, Germany, MadC (Claudia Walde) considers herself to be a citizen of the world. She holds degrees in graphic design from the University of Art and Design, Halle and Central Saint Martins College, London. Taking an interest in street art from teenage years, MadC spent her early twenties researching street art that got published in the form of two books, Sticker City – Paper Graffiti Art (2007) which explored the culture of hand-painted and hand-crafted stickers and posters followed by Street Fonts – Graffiti Alphabets from Around the World (2011) where she got 154 artists from 30 countries to design the 26 letters of the Latin alphabet. The research into the books and her knowledge of graphic design has influenced her personal work where she has developed her own style of painting both on the street and in the studio. 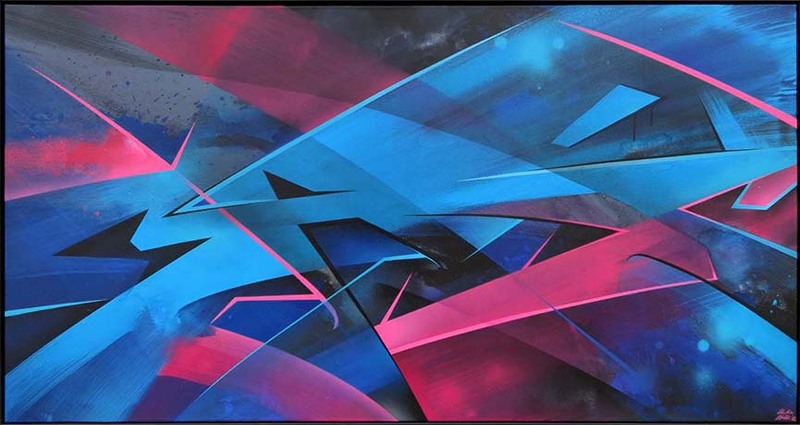 The new exhibition Night and Day by MadC opens at the 44309 Street Art Gallery, Dortmund, on January 10th 2015 and will run until February 21st 2015. An event page has been created here. 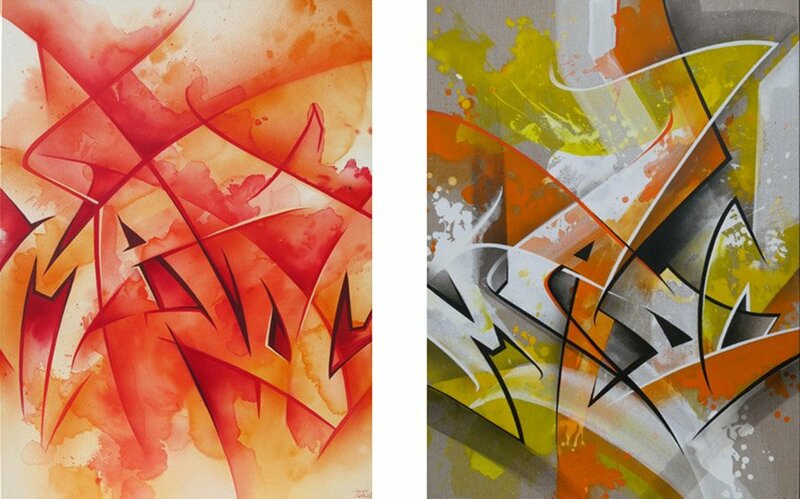 Follow all the latest street and urban art news by signing up to My Widewalls today.